Spent a few hours in the vineyards to the north west of Omodos where there were many singing Black-headed Bunting and Cyprus Wheatear. Had good views of Cyprus Warbler, Serin, Eastern Olivaceous Warbler and Long-legged Buzzard as well and there were many Common House Martin with a few Red-rumped and Barn Swallow overhead. The best part of the time there was when I drove along the road to Agios Nikolaos and found a family party of four Black-headed Bunting juveniles flying from mosphilia bush to the vines and back. At one stage there were several young Corn Bunting, a couple of juvenile Spanish Sparrow, a young Common Linnet and Sardinian Warbler and two of the Black-headed Bunting in the same bush! Great birding moment! 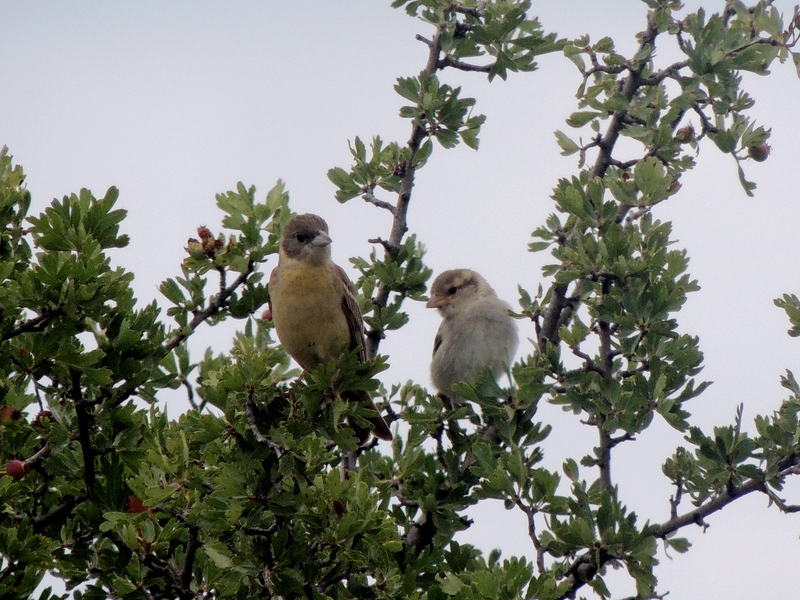 Light was really bad so the photo of one of the young Black-headed Bunting with a young Spanish Sparrow is the best of a very poor bunch. Categories: Birding | Tags: Black-headed Bunting, Corn Bunting, Cyprus Birding, Cyprus birds, Cyprus birdwatching, Cyprus Warbler, Cyprus Wheatear, European Serin, Long-legged Buzzard, Spanish Sparrow | Permalink.